I made it, it is high noon on Sunday. So far this week has included memorable adventures with good friends, ghost towns, the finalizing of road trip plans for the October odyssey, a near disaster, playing guide to international journalists from France, the Czech Republic and India, creating presentations for the Needles Chamber of Commerce fund raising dinner, Cuba Fest, and Missouri History Museum, intriguing electrical problems with the Jeep, Chillin’ on Beale, a couple of delightful dinners seasoned with laughter and lively conversation, forgotten desert cemeteries, and a couple of meetings. To say the very least, this week has been most interesting and quite exhausting. Last Saturday evening, my dearest friend and I enjoyed a delightful dinner at Mattina’s in Kingman. This hidden little gem located a few blocks north of Andy Devine Avenue (Route 66) in the city’s historic district isn’t suited for those operating on a McDonald’s budget. However, if your looking for superb Italian food in Kingman, unique ambiance and an expansive wine list, or locally brewed beer, this is the place. A sense of humor is needed to best appreciate the ambiance and menu offerings. As we were celebrating thirty-three years as husband and wife, a bit of a splurge seemed in order. North Side Tony’s Tortellini and Sophia Loren Florentine comes highly recommended. The persistent summer cold/allergies that plagued me for two weeks has wavered in intensity and drained me of energy so on Thursday I decided the time had come to see a doctor. Diagnosis; sinus issues resulting in throat and lung irritation. On Tuesday evening, my dearest friend and I enjoyed a most delightful dinner at Calico’s with Henk Kuperus of Netherlands based US Bikers, his tour group, and our dear friend Dries Bessels. The Kuperus brothers and the Bessels, along with the Bor’s and Boersma’s, were our generous hosts, tour guides, baby sitters, and language counselors during the trip to the Netherlands in January 2015. As Dries and I share a sense of adventure, over the years we have had more than a few very memorable outings including some exploration of WWI sites around Ypres Belgium with stops at places like the engineering marvel of Maeslantkeringweg. Another outing of note included his charming wife (Marion), sister, and brother-in-law, my dearest friend, Sean Evans and his wife, on a very blustery day at Two Guns. 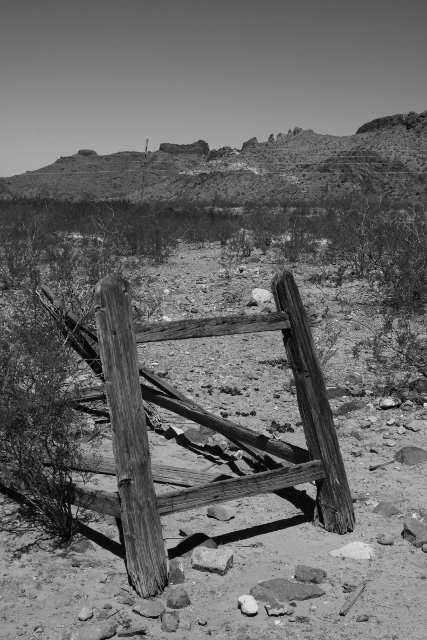 For quite sometime we have talked of an odyssey to Oatman with some detailed exploration that included searching out the long forgotten cemetery in the ghost town of Gold Road. On Wednesday we were able to check this one off our list. The cemetery is but one of the fast fading vestiges in this old mining town that had an accidental discovery by Jose Jerez in May 1900 along the original course of the Beale Wagon Road as a cornerstone. On the day of our adventure the temperatures were almost perfect, somewhere in the mid 80’s with a slight breeze, and the sky cloudless. 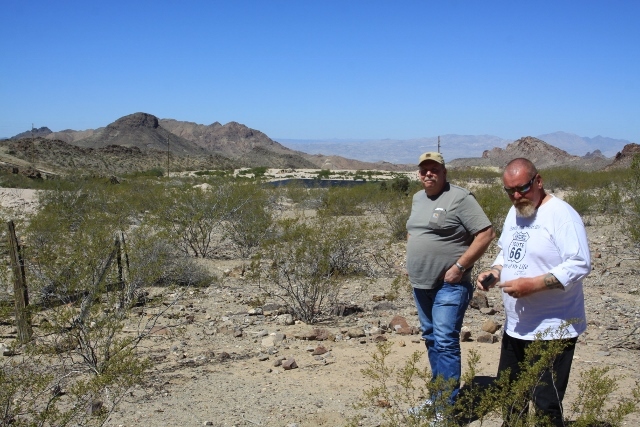 Our drive to Oatman was amply sprinkled with stops at place like the old family homestead and the site of Fig Springs Station. I talked a bit of history and the conversation was lively. Bessels at the forlorn old cemetery. It was just after we cleared the summit of the pass that things took a very unexpected turn. 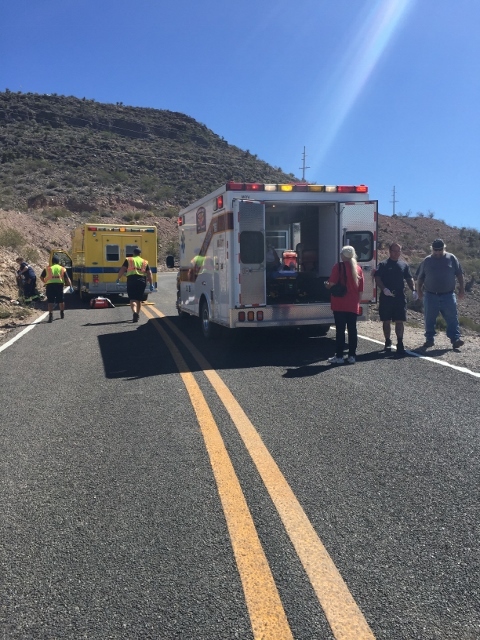 An elderly brother and sister from Kingman were traveling to Oatman with friends when they lost control of their motorcycle and steered it into an embankment. Jeans and t-shirts provide scant protection for a body bouncing and sliding on pavement, gravel, sand, and into cacti. We arrived on scene mere minutes after the accident, and shortly after a gentlemen headed east had stopped. As it turned out, this stranger had once worked on an ambulance. I called the fire department in Oatman and provided water, Dries and other travelers directed traffic. We provided assistance where possible. The driver suffered extensive road rash. His sister was the concern; broken arm, road rash, and a severe bump and cut on the head. Kudos to the Oatman fire department as they responded in as timely a manner as the road allowed. 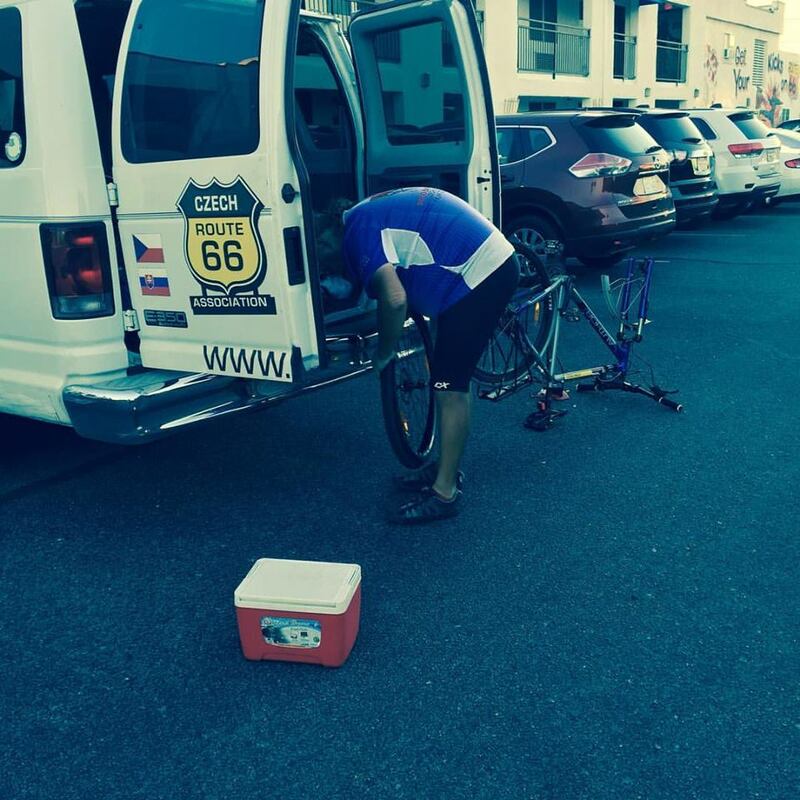 Likewise with the ambulance crew even though it took them a bit longer (they came from Bullhead City). I am not a motorcycle rider. However, being an ardent fan of convertibles and in my youth, bicycles, I know on a warm day how tempting it is to forego the constraints of a helmet and assorted protective gear. This little tragedy on old Route 66 provides an illustrated sermon on the importance of such gear. Shortly after the departure of the ambulance, traffic began flowing again and we continued on our westward journey toward Oatman. The first stop was in Gold Road, and as luck would have it, we met Jim, the caretaker in charge of security at the temporarily closed mine. A most gracious host, after inquiring about the cemetery we piled into his dusty quad and set out on the rutted, rocky track that coursed below stark towers of waste materials from the mine and ore processing. Along the way he pointed out an occasional stone wall, all that remained from the jail, and similar remnants from a once bustling community erased in an effort to avoid tax liabilities back in the 1940’s. Little remains of the cemetery; a faint outline of a grave framed with stones, a weathered and collapsing wooden fence. Still, it provided a tangible link to when this was a place where people dreamed, loved, hoped, and died. The international nature of our week rounded out on Friday and Saturday. On Friday evening we enjoyed a great dinner with Zdenek Jurasek, a friend from the Czech Republic who wears many hats including president of the Czech Route 66 Association, and his traveling companions, Petra Savaskan and Tomas Zindler. Joining us were a few Kingman celebrities like Greg Arnold, the city manager and his wife, and other local Route 66 enthusiasts. On Saturday morning, as Zdnek headed west on his solo bicycle ride on Route 66, I provided a brief tour of the Kingman historic district. On the heels of that tour, I met with a team of French journalists, and provided an interview as well as tour of Kingman. Latter that afternoon I met with the director and producer of the Jim Hinckley’s America Trek Across Route 66 video series that is currently under development. A teaser can be viewed at the Promote Kingman website. To wrap up the first video in the series, we hit Chillin on Beale. As always, it was a lively event with a wide array of colorful vehicles on display. I think that this will add some series vibrancy to the first episode. Now, some much needed rest, wrapping up the loose ends from last week, and preparing for what promises to be a wild woolly week or two.